FIG is the premier international organization representing the interests of surveyors worldwide. It is a federation of the national member associations and covers the whole range of professional fields within the global surveying community. It provides an international forum for discussion and development aiming to promote professional practice and standards. FIG was founded on July 18 1878 in Paris by delegates from seven national associations - Belgium, France, Germany, Great Britain, Italy, Spain and Switzerland - and was known as the Fédération Internationale des Géomètres. This has become anglicized to the International Federation of Surveyors. It is a UN-recognized non-government organization (NGO), representing more than 120 countries throughout the world, and its aim is to ensure that the disciplines of surveying and all who practise them meet the needs of the markets and communities that they serve. Cras dictum enim vitae pellentesque finibus. Nullam feugiat magna sit amet tristique sollicitudin. Suspendisse non turpis ut risus aliquet varius in et leo. Cras ut elementum lorem. Nulla laoreet at mauris id molestie. Praesent lobortis eget ipsum a lobortis. Fusce at dapibus velit. Duis faucibus imperdiet sapien, sit amet commodo lorem. Mauris quam enim, fermentum quis nunc at, lobortis sagittis nisi. Ut consectetur elementum felis ac tempor. Nam dignissim leo quis metus mollis, vel mollis nisl hendrerit. Mauris rutrum dolor nisl, ut tincidunt justo iaculis id. Aliquam non interdum purus, ut placerat elit. Duis mollis nibh eget ante malesuada varius. The Commission recognises the three pillars of ESD, i.e. balancing the competing development demands associated with economic, social and environmental aspiration. Mr. Kwame Tenadu Snr. holds a Master of Arts Degree in Environmental Management and Policy, a Land Surveyor’s License, University Diploma in Geodetic Engineering and a Certificate in Land Surveying. He is a Professional Land Surveyor of the Ghana Institution of Surveyors and was a Governing Council Member for several years. He was a key member of the committee responsible for international relations and export of professional services, a member of and the current President of the Licensed Surveyors Association of Ghana www.lisagh.org, a member of the International Federation of Surveyors and the Chair for Commission 8 in charge of spatial planning and economic development www.fig.net, an associate member of the Commonwealth Association of Surveyors and Land Economists and has had over 30 years experience in land surveying and land administration in both Ghana and Nigeria in West Africa. 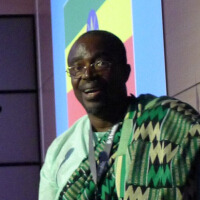 Kwame is the Managing Director of Geo – Zenith Limited, a firm he founded since 1993. Since 2010, Geo Zenith Limited has been rebranded to UDANET LIMITED with expanded business to include construction and professional capacity building consultancies for land surveying professionals in West Africa. Kwame is multi – lingual and has working knowledge level of French and Spanish. He also has over thirty year’s specialist experience in surveying, land administration and management and business strategies with environmental and sustainable issues as a private sector practice.